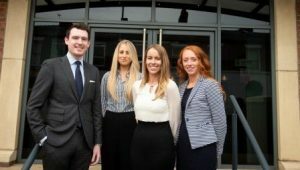 Law firm SAS Daniels LLP has expanded its litigation, commercial property and employment and HR departments following the retention of four trainee solicitors who have successfully completed the firm’s two-year training scheme. 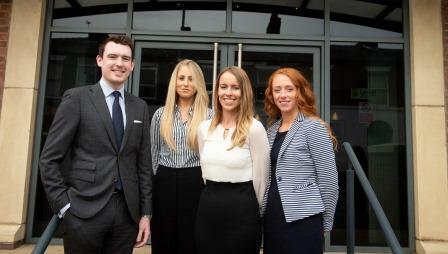 Gemma O’Brien, Katie Hitchen, Charlie Wood and Alex Nortier beat over 100 applicants to land a place on the coveted training programme and began their trainee contracts in September 2016. To complete the scheme, each solicitor has undertaken four, six-month placements across various departments in the firm. Following this, Gemma O’Brien, Katie Hitchen, Charlie Wood and Alex Nortier have been placed in the litigation, commercial property and employment and HR teams respectively. SAS Daniels has an annual intake of trainee solicitors and its sought-after programme attracts up to 120 applicants each year. Following the qualification of the trainees, the firm also has three trainees in their second year, currently in the private client and corporate departments and two new starters on training contracts in the family and residential property teams. Applications for the next training contracts will open from 1st January 2019 and close on 8th March 2019 for the September 2020 intake.